Tata Motors is all set to launch their prized mid-size SUV, the Harrier, today. The big news for the Harrier, apart from its unique styling, is actually what's under its sheet metal - it's underpinned by the platform from Land Rover. You can read additional details about the Tata Harrier right here, as we lead up to the all-important price announcement. Don't forget to check back here for updates right from the launch event. Prices are out! The Tata Harrier has been launched at prices starting at Rs 12.69 lakh, going up to Rs 16.25 lakh, ex-showroom. Guenter Butschek, CEO and MD of Tata Motors India, and Mayank Pareek, president of Tata Motors passenger cars division, herald in the Harrier onto the stage. The price announcement can't be far now! Tata Motors sees the customer base for the new Harrier as upscale lifestyle considerate people, among others. 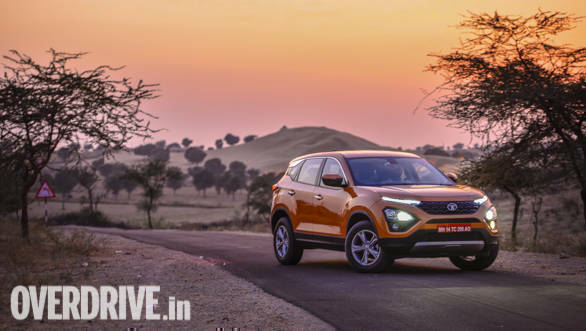 Tata Motors assures that the Tata Harrier has been tested extensively (for over 2.2 lakh km) in all kinds of weather and terrain. It has also been put through 300+ real life crash situations for better safety. The Tata Harrier will be built on an all-new production line that uses J-LR scale production processes. It has 90% automation with over 100 robots working on the line. Standing out, in comparison to the competition, Tata Motors has endowed the Harrier with hydraulic power steering instead of an electrically-assisted unit. This gives the steering a more direct feel and provides better feedback to the driver. Powering the Harrier is a 2.0-litre four-cylinder diesel engine, dubbed Kryotec by Tata Motors. Power figures stand at 140PS and 350Nm torque, mated to a six-speed manual gearbox. Interestingly, this engine is sourced from Fiat and is in a lower state of tune than in the Jeep Compass, where it also finds a home. This powertrain is the only one on offer at the moment, though an automatic version is planned. Another highlight is the part digital instrument cluster, which features a 7-inch display integrating the tachometer and some of the functions of the infotainment screen like music, navigation and more. Needless to say, the infotainment system offers Apple/Android smartphone integration. Taking centrestage in the cabin, is a floating 8.8-inch touchscreen. The top of the dashboard is covered in soft touch plastic, followed by a textured wood finish, and further down there's a perforated leather-wrapped cavity to stow knick-knacks. Viewed in profile, the Harrier's length stands out. It’s a big SUV! Dimensions come in at 4,598x1,894x1,706mm (LxWxH), which makes it a good bit larger than the Jeep Compass, a rival it has square in its sights. The rear looks very distinctive thanks to the three-dimensional design of the tail lamps as also the gloss black strip connecting them from end to end. There aren't any badges on the tail gate except for the Harrier name, which has been placed interestingly, right in the centre, under the number plate. The Harrier's face grabs your attention first thanks to the LED daytime running lamps sitting right on top of the piano-black finished grille, while the headlamp units sit way below. Based on Tata's Omegarc or Optimal Modular Efficient Global Advanced Architecture platform, the platform is a derivative of Land Rover's D8 that underpins SUVs like the Land Rover Discovery Sport, Range Rover Evoque and Jaguar E-Pace! Starting with where the Harrier’s journey from the H5X concept at the 2018 Auto Expo to its final form. Thankfully, not much has changed, with the Harrier carrying a lot of the butch, aggressive styling through to production.